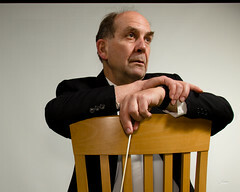 PHILIP COLLINS co-founded New Music Works and has served as the organization’s Artistic Director and Conductor since 1982. Collins has guest-conducted numerous ensembles and has performed residencies at the San Francisco Conservatory of Music, the Cabrillo Festival of Contemporary Music, and at Vassar College on a Martha Farmer Fellowship. His orchestral and chamber works have been played throughout the U.S. and Canada. He has also composed and conducted for numerous theatre companies and colleges including, Shakespeare Santa Cruz, Western Stage, Mount Madonna Players, UC Santa Cruz, and Cabrillo College. As a lecturer, Collins has been hosted by numerous schools and conferences, including the Cabrillo Festival of Contemporary Music, the American Composers Forum, San Francisco Conservatory of Music, and in February 2007 he lectured in Wellington, New Zealand, for the ACL (Asian Composer League). Awards include: First Prize (Air), 1996 International Clarinet Society Composition Competition; First Prize (Sappho Songs), 1994 L’ARCIM Festival in Montreal; The Gail Rich Award; and Dramalogue Award for Best Musical Direction. Collins studied composition with Edwin Dugger, Lou Harrison, and Henry Onderdonk. He studied conducting under Nicole Paiement at UC Santa Cruz; classical guitar with Stanley Beutens; and jazz guitar with Jerry Hahn. He holds a Bachelors in Music Composition from San Francisco State University and a Masters in Music (conducting) from University of California Santa Cruz.